Last year fantasy author Liane Merciel released her debut epic fantasy The River King’s Road: A Novel of Ithelas. 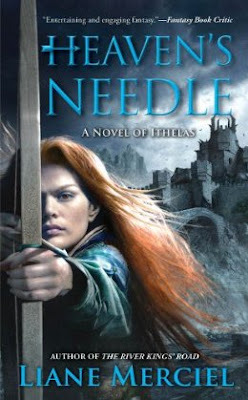 This April 26 the series returns with the release of Heaven’s Needle. In this second part of the giveaway, you can enter a draw for a copy of Heaven’s Needle. To enter, simply complete the form at the end of the post. Many thanks to Simon and Schuster for the contest. The mountain fortress of Duradh Mal was mysteriously destroyed centuries ago. And now, in its shadow, evil stirs. . . . Unaware of the danger, two inexperienced Illuminers set out for the village of Carden Vale, at the foot of Duradh Mal, to minister to the people. The warrior Asharre, her face scarred with runes, her heart scarred by loss, is assigned to protect the young clerics. But in Carden Vale they find unspeakable horrors—the first hint of a terrifying ghost story come true. The Sun Knight Kelland has been set free by the woman he loves, the archer Bitharn, but at the cost of undertaking a mission only he can fulfill. Joined by a Thornlord steeped in the magic of pain, they too make their way to Duradh Mal. There lies the truth behind the rumors of the dead come back to life, flesh ripped from bones, and creatures destroying themselves in a violent frenzy. And if Kelland cannot contain the black magic that has been unleashed after six hundred years, an entire world will fall victim to a Mad God’s malevolent plague. . . .